Shoot like a girl? That’s a source of pride at the University of Nebraska-Lincoln. The Nebraska Huskers womens’ shooting team, Nebraska Rifle, has a strong tradition of excellence. Led by Coach Stacy Underwood, the Huskers are ranked among the top teams in the country. In the past 10 years, the Huskers have earned four Top-5 finishes in the NCAA Championships, and Nebraska has had over 30 All-American selections, as well as individual national champions. This video spotlights some of the current members of 2013-14 Nebraska Rifle Team: Alexandrea Lorentz, ReAnn Wilson, Magdalena Mical, Lauren Phillips, Rachel Martin, Denise Martin, Sunny Russell, Marissa Major, Jaycee Carter, and Kelsey Hansen. Here is a more detailed video that shows the Nebraska Training Range, complete with electronic targets. This is one of the most advanced collegiate shooting facilities in the nation. Q: What is your coaching philosophy? A: Rifle is the only NCAA sport where you compete against yourself without awareness of how your fellow competitors are doing, until you’re finished. Only then are scores compared. So my athletes have to be totally self-contained — in motivation, discipline, and focus. Even more, my athletes have to be supremely calm. A minute waver of even hundredths of a millimeter at the rifle barrel end can throw a shot way off a center target that’s the size of a pin head at 10 meters away. Very slight differences in breathing, heart rate, pulse strength, and muscle twitch amplify that waver. Finally, rifle is a sport of slight differences. A perfect individual match score is 1200 points. A perfect team score is 4800 points. Perform at 96 percent of perfection and you’ll be marginally competitive. Perform at 98 percent of perfection and you’ll be setting NCAA records. It’s in that two percentage point spread that you find greatness in rifle. So, given these rigors, I’ve organized my coaching philosophy around the idea of “just 1 percent more”. I’m asking each team member to give just 1 percent more in all areas- academics, personal development and performance. Sounds simple, but think about what’s involved. Every team member has to deliver. To deliver, they’ll have to organize all the areas of their lives so they’re always ready mentally and physically. Any issues that come up can be referenced by “what will get us just 1 percent more”. They can learn from each other what works. Their lives – mind and body – will be in sync and at peace. That will give them calm. So my efforts will focus on helping each one achieve their goal. I expect great individual surprises, and from that, a great team result. Photos courtesy NU Media Relations. Share the post "Spotlight on Successful Nebraska Women’s Shooting Team"
Got QuickLOAD software? Then it’s time to upgrade your data files. 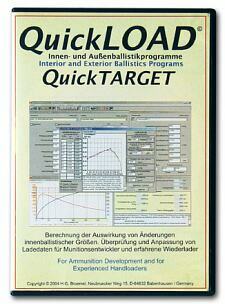 The makers of QuickLOAD have released a new CD with updated data files (for propellants and projectiles). Updated just before SHOT Show, the new CD is current as of January 12, 2014. This data update disk adds the latest available powder, cartridge, and bullet files to your current version of QuickLOAD/QuickTARGET. This disk will work for QuickLOAD versions 3.0, 3.1, 3.2, 3.3, 3.4, 3.5, 3.6 and early 3.8. Price for the update disk is $15.95. In the North America, order from Neconos.com, or call 800-451-3550 (9 am to 5 pm Pacific Time). In the United Kingdom, you can get the update disk from JMS Arms, Merrivale, London Road, Handcross, West Sussex, RH17 6BA, England, Phone: 01444 400126. QuickLOAD is a pretty amazing program. Using information for over 1200 cartridges, 250 powders, and 2500 bullet types, QuickLOAD allows you to predict velocities and pressures for your hand-loaded ammo. You can check predicted pressures with different powder choices and seating depths before loading an actual round. If you do not yet own QuickLOAD, you can now order the latest Version 3.8 of this unique software. Priced at $152.95, the latest version 3.8 contains all the updates through January 12, 2014. This can be purchased for $152.95 from Neconos.com. For a full explanation of the features and benefits of QuickLOAD software, click the link below. Share the post "2014 QuickLOAD Data Update CD Now Available"
Coating bullets with a friction-reducing compound such as Molybdenum Disulfide (Moly) offers potential benefits, including reduced barrel heat, and being able to shoot longer strings of fire between bore cleanings. One of the effects of reduced friction can be the lessening of internal barrel pressures. This, in turn, means that coated bullets may run slower than naked bullets (with charges held equal). To restore velocities, shooters running coated bullets are inclined to “bump up” the load — but you need to be cautious. We caution shooters that when your start out with coated bullets in a “fresh barrel” you should NOT immediately raise the charge weight. It may take a couple dozen coated rounds before the anti-friction coating is distributed through the bore, and you really start to see the reduced pressures. Some guys will automatically add a grain or so to recommended “naked” bullet charge weights when they shoot coated bullets. That’s a risky undertaking. Instead we recommend that you use “naked” bullet loads for the first dozen coated rounds through a new barrel. Use a chronograph and monitor velocities. It may take up to 30 rounds before you see a reduction in velocity of 30-50 fps that indicates that your anti-friction coating is fully effective. We have a friend who was recently testing moly-coated 6mm bullets in a 6-6.5×47. Moly had not been used in the barrel before. Our friend had added a grain to his “naked” bullet load, thinking that would compensate for the predicted lower pressures. What he found instead was that his loads were WAY too hot initially. It took 30+ moly-coated rounds through the bore before he saw his velocities drop — a sign that the pressure had lowered due to the moly. For the rounds fired before that point his pressures were too high, and he ended up tossing some expensive Lapua brass into the trash because the primer pockets had expanded excessively. LESSON: Start low, even with coated bullets. Don’t increase your charge weights (over naked bullet loads) until you have clear evidence of lower pressure and reduced velocity. If you shoot Moly, and clean the barrel aggressively after a match, you may want to shoot a dozen coated “foulers” before starting your record string. Robert Whitley, who has used Moly in some of his rifles, tells us he liked to have 10-15 coated rounds through the bore before commencing record fire. In a “squeaky-clean” bore, you won’t get the full “benefits” of moly immediately. To learn more about the properties of dry lubricants for bullets, read our Guide to Coating Bullets. This covers the three most popular bullet coatings: Molybdenum Disulfide (Moly), Tungsten Disulfide (WS2 or ‘Danzac’), and Hexagonal Boron Nitride (HBN). The article discusses the pros and cons of the different bullet coatings and offers step-by-step, illustrated instructions on how to coat your bullets using a tumbler. Share the post "Safety Tip for Shooting Coated Bullets"